The clean and simple design of Apple's iconic iPhone could become even simpler, thanks to a new concept that describes concealing the FaceTime camera within the earpiece speaker slot, and even adding a camera flash module that would illuminate forward facing pictures. The idea was presented in a newly published patent application discovered on Thursday by AppleInsider, entitled "Electronic Device with Camera Flash Structures." The proposed invention describes a camera and accompanying flash that could be hidden under the speaker port mesh found on a portable device like the iPhone. Currently, the camera and ambient light sensor for the iPhone are located to the top and left, respectively, of the speaker hole on the iPhone. And there is also no camera flash for the FaceTime lens to illuminate "selfies" and other forward facing shots. While the spaces for the camera and light sensor can be seen at certain angles on the black front-glass panel of the iPhone 5s, these spaces are readily apparent on the white glass that is found on the white and gold versions of the handset. These black "dots" stand out on what is otherwise a clean and simple appearance. As detailed in the new patent filing, Apple has experimented with addressing this by placing the camera inside the speaker hole found atop the front of the iPhone. 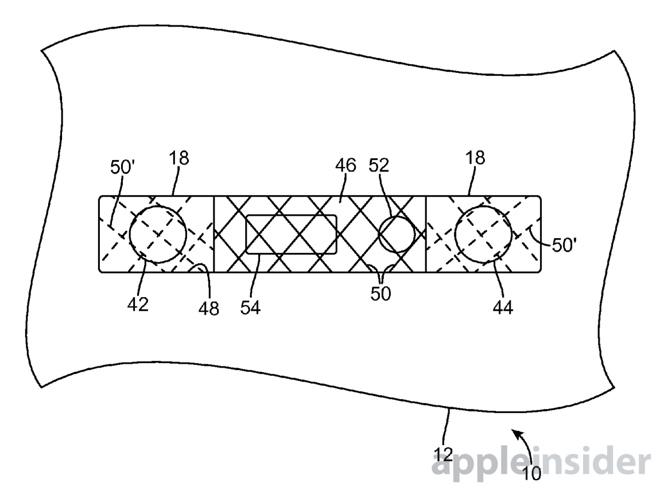 In the application, Apple states that the lens, along with a camera flash, could be located under the speaker port mesh, making them essentially invisible to users and providing a cleaner design. Apple even notes that the addition of a camera flash to the front of the iPhone could be beneficial for more than photos. In the filing, the company says that adding a small light to the speaker slot could serve as a "status indicator," notifying users when a message has been received. In the filing, Apple notes that if camera components are "poorly mounted" within a portable device, the result can "detract from an otherwise aesthetically appealing device appearance." It describes its concept as a potential improvement that could make its way into future products. The proposed invention, made public this week by the U.S. Patent and Trademark Office, was first filed by Apple in February of 2013. It is credited to inventors Lee E. Hooton and Kelvin Kwong.